Working in partnership with Theatresearch and using archive photography to develop accurate recreations of the light fittings that were installed at the Theatre Royal in Newcastle in the early 20th Century, we recreated a sunburner for the auditorium of the Theatre Royal in Newcastle. Retaining all the beauty of the original fitting, whilst taking advantage of the latest lighting technology, the sunburner was manufactured at our South London factory alongside a further 150 fittings for the theatre. Our work included ceiling lights for the main auditorium made in cast brass and featuring leaf patterns as well as fifty wall lights for the main foyer and staircase and chandeliers that have been fitted throughout the building formed using cast brass and handblown glass. 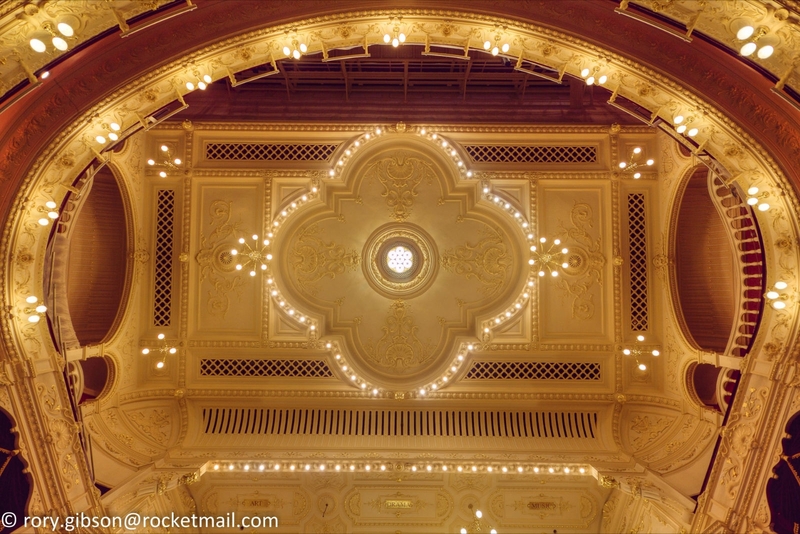 The original sunburner was installed in 1901 at the Theatre Royal as part of celebrated theatre architect Frank Matcham’s classic Edwardian design, and used gas lighting. The magnificent new light uses a combination of fibre optics and colour-changeable LED’s that can be altered to suit the required mood. In addition, the ceramic bowls that sat above the gaslights have been replaced by white sprayed metal castings to reduce the weight of the fitting and its cost, both important factors for public buildings today.